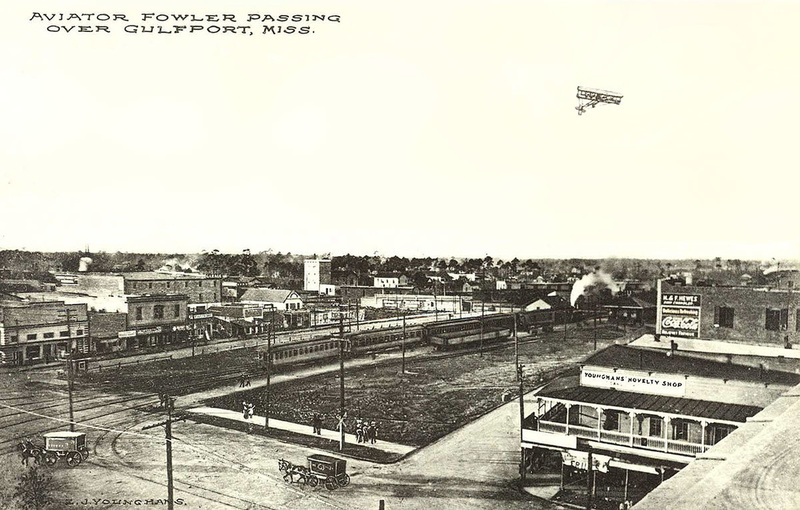 Fowler left New Orleans between rain showers at 1 p.m. on January 4, 1912. Flying against a cold north wind, the nattily dressed Californian, who without fail always wore his trademark winter-weight sweater and a tie, landed his plane on a grassy expanse west of Gulfport at Pass Christian. During that day, hundreds of citizens of Bay St. Louis, Waveland, and the other small coast towns searched the skies after hearing the drone of the Wright engine and then with outstretched arms waved gleefully as the first airplane in history to visit the Mississippi Gulf Coast flew over their heads. The next day, Fowler left the Pass and headed straight for Biloxi. After only a few minutes of flight, he reached the skies over Gulfport, where a writer for the Biloxi Daily Herald reported him to be about 2,500 feet in the air. "Hundreds of people lined the streets of the city to see the daring airman," reported the newspaper. Gulfport novelty shop owner E.J. Younghans, ever the entrepreneur, had a photographer ready atop the Gulf and Ship Island Railroad headquarters building. A photo taken by the photographer, perhaps the only one professionally taken, was made into a postcard that became a popular seller for months.